HITTING THE TRAILS – GUMBOOTS REQUIRED! 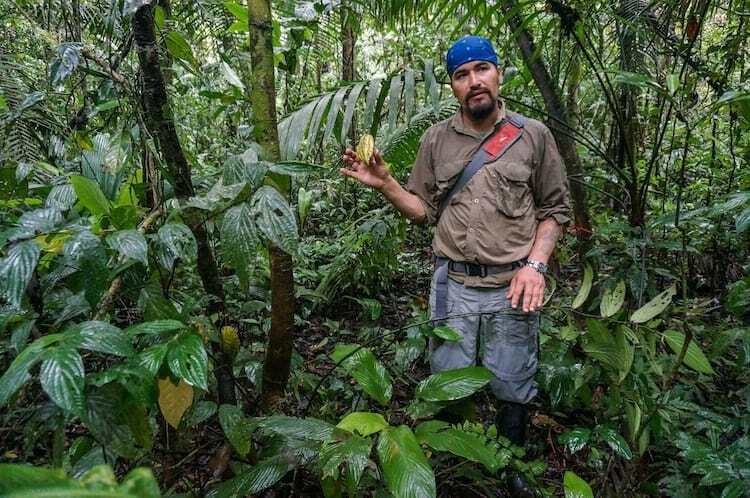 Going to the Amazon Rainforest has been one of our dreams for a long time now. 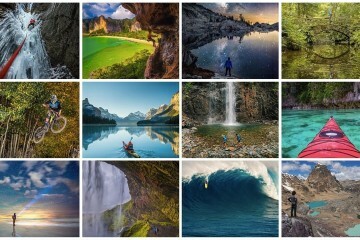 As nature lovers, visiting unique places and having new wildlife encounters is what keep us exploring the planet. 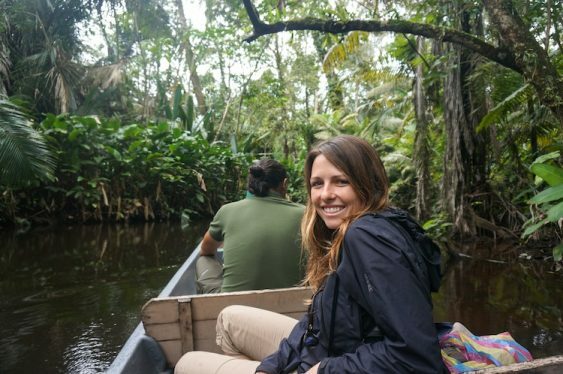 Visiting South America and skipping the Amazon just wasn’t an option for us. Staying in a Ecuador Eco Lodge was definitely in our plans. As we were coming from Colombia, we started looking for an opportunity in Ecuador to make it happen. After doing a lot of research, we decided to go with La Selva Lodge. 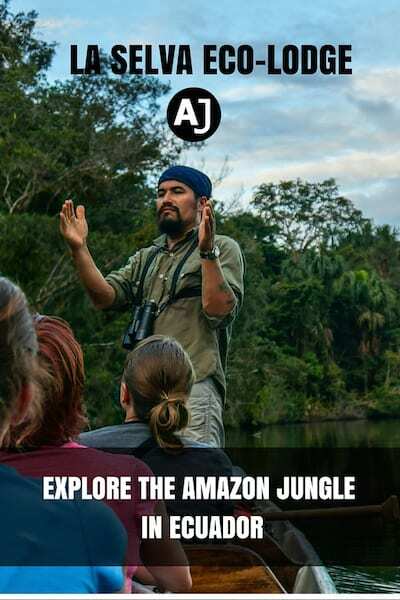 Our dream of visiting the Amazon finally came true. We ended up spending 4 days / 3 nights at the Eco Jungle Lodge “La Selva” in the Yasuní Biosphere Reserve, on the shores of the Napo River. During this time, we had the opportunity to explore the surroundings through different activities such as canoe rides, hiking walks, bird watching and fishing. La Selva Lodge offers a great service to experience the Amazon rainforest. Visitors are divided into small groups (4 or 5 is normal, ours was only of 3 people), and every group has 2 guides: 1 bilingual naturalist guide and 1 local guide. These groups do different activities during the day and never go together to the same place. It really makes a difference having small groups when you are trying to spot wildlife, so we were very happy with that. 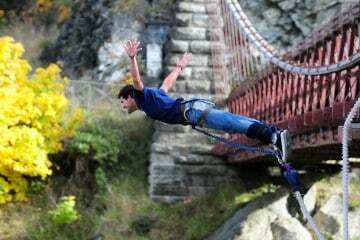 The activities are not fixed and are discussed between the guides and the group. Depending on what the group wants to do, and the weather conditions, the guide will take you to one place or another. In our case, we didn’t want to go to the local village as we preferred to spend more time spotting wildlife, so that’s what we did. We loved this flexibility. The overall experience was incredible. It’s highly recommended to bring a good camera for travel photography. Every day we headed to the jungle looking for wildlife. We saw tons of different animals, some of them I’ve never seen before. 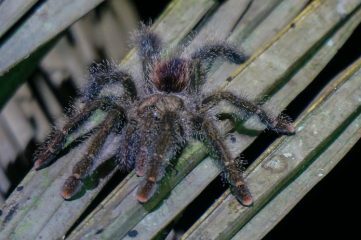 We also had the opportunity to snap beautiful pictures of the Amazon rainforest, its plants and its animals. The following are the activities we did during our stay. Even before we arrived to the lodge, we had our first canoe trip. 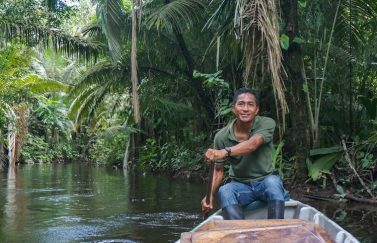 To get to the lagoon where La Selva is located, you need to navigate a small creek from the Napo river. That’s when we spotted a boa, sitting on a tree we were passing just below! What a welcoming ride. 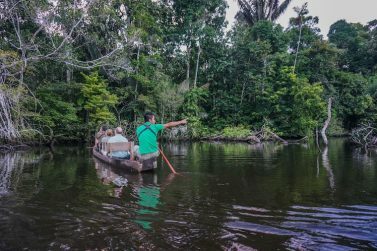 The canoe excursions were also a great way to spot some mammals such as monkeys and sloths, as they live high in the trees, making it very hard to see them from the ground. We had the opportunity to spot several groups of Howler, Squirrel and Capuchin monkeys, and 2 sloths. The absolute highlight of the trip happened during a canoe ride. 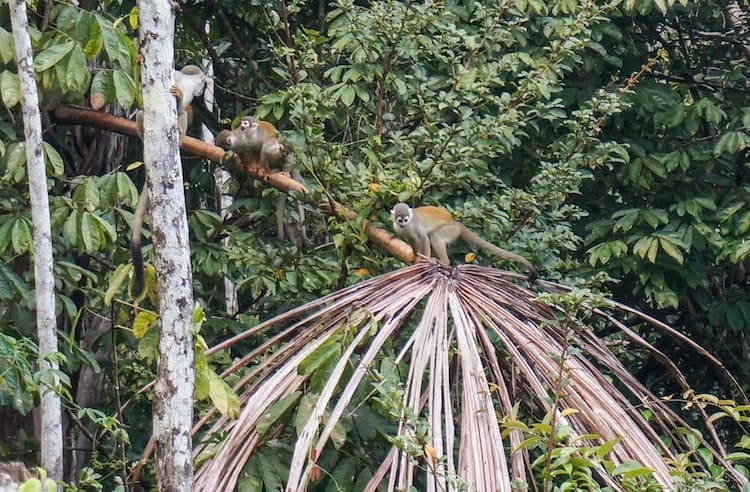 We were watching a large group of Squirrel monkeys when they suddenly started to make a strange noise. Our guide commented: “something is happening, that noise is not normal”. So we got closer to the group to discover what happened. 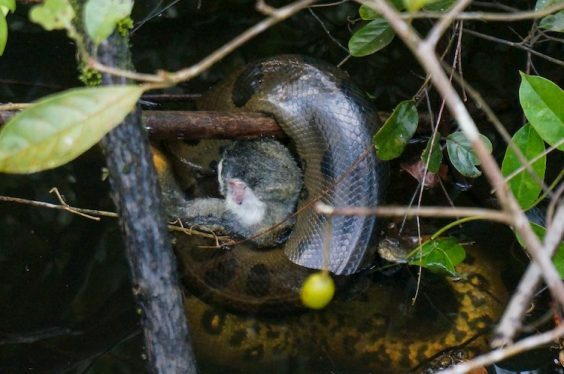 One of the monkey had fallen into the water, when an anaconda had grabbed it to strangulate it to death. All that in front of us. At just couple of meters from our canoe! 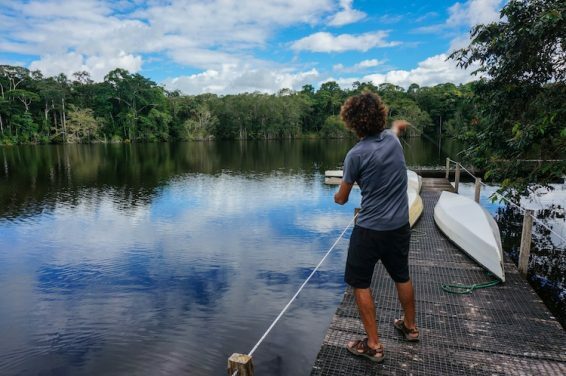 During your free time, normally between lunch and the afternoon activity, you can either take a nap, kayak around the lagoon on your own or try your luck fishing. I opted for the later one. 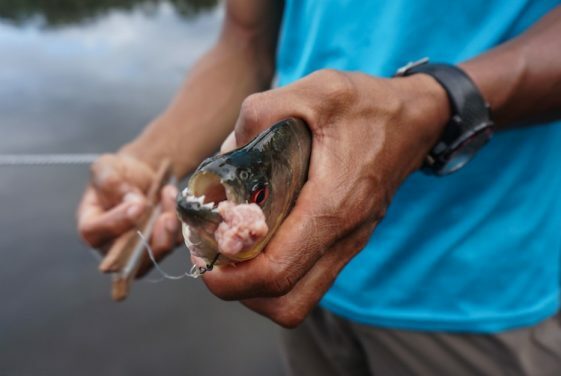 Rolando, our local guide, helped me with some bait and home-made hand lines. The lagoon is so full of life that you don’t need to go far. Just from the lodge’s dock you can throw your line and hope for the best. In the 45 minutes I was fishing I caught 1 “perro” and 1 piranha. 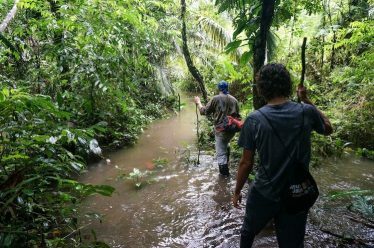 Apart from paddling a canoe, the best way to explore the jungle is on foot. There are many different hiking trails around the lodge and all of them represent a chance to spot wildlife. Some of them are harder than others and, depending on your group and the weather, the guide will choose one or the other. During the 4 days we were at La Selva, we did a total of 3 hiking tracks: 2 during the day and 1 at night. One of the longest ones (4 hours) the path was very flooded due to the heavy rains from the previous night. That made the walk even more challenging but at the same time more rewarding. We were lucky to spot our second anaconda. This time a large individual. She was chilling out in a stream we were about to cross! At first, all we could see was her head. Then, when she turned around the whole body was revealed. 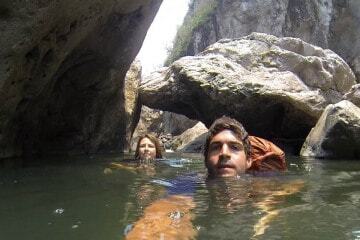 After she disappeared in the murky water, it was the time for us to cross the stream. It was my fastest river crossing ever. The other day walk was done at the Yasuní National Park, situated on the southern side of the Napo river. This area proved to be hillier than the others, so different plants and wildlife can be spotted. We had the chance to spot 2 peccaries (wild boars), some macaws and a couple of tucans. The night walk was done on our first day. It was a short one, about an hour and a half, ending at the lodge. 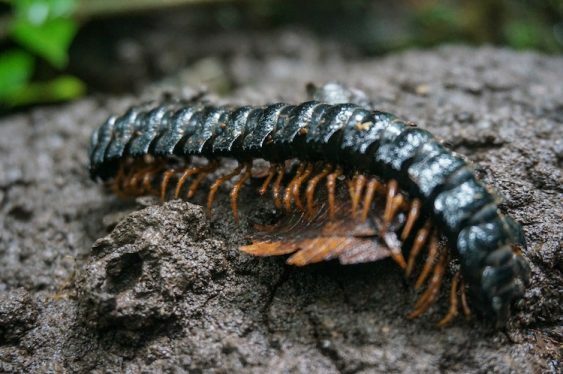 Using our flash lights we were able to spot different kinds of insects and reptiles including poison dart frogs and tarantulas among many others. + The perfect combination of luxury and adventure. + High level of professionalism and service of the staff and guides that you can see from the prompt responses to emails to the organisation throughout the tours. + Opportunities for amazing wildlife encounters. + Delicious food. The meals served were well prepared and full of flavour. – Although the food was delicious, the portions could be bigger. Be sure to bring several changes of clothes. 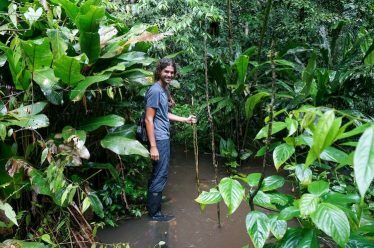 It’s normal to get your clothes wet in the jungle due to rain, your own sweat or walking in flooded trails. The humidity is so high that your clothes won’t dry overnight. Also, don’t forget socks to wear with the gum boots. 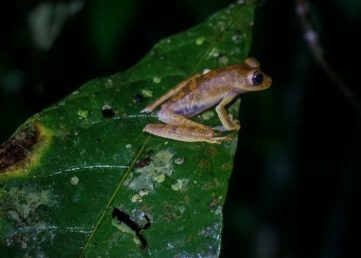 The Ecuador Eco Lodge La Selva offers 4days/3nights and 5days/4 nights packages. Extra nights can be arranged . Anytime of the year is a good time to visit this part of the Amazon. Being so close to the Equator, the overall climate doesn’t change much from month to month. Everyday you can expect some sunshine and some rain, which helps keeping the bugs away. The easiest way is flying to Coca from Quito. In our case, as we were traveling overland from Colombia, we met the group at the dock in Coca. If you are looking for an unique experience when visiting the Amazon, staying at an Ecuador Eco Lodge is an excellent choice. 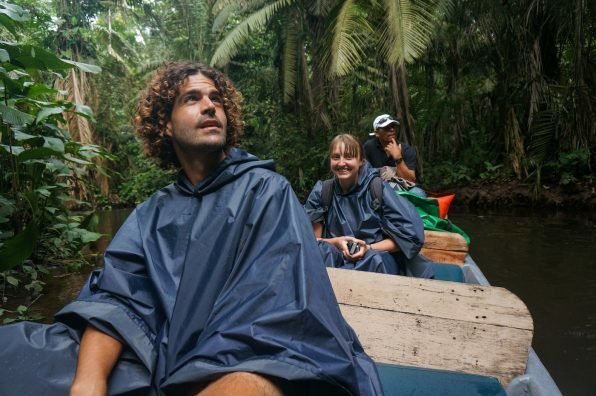 La Selva is a fantastic option for its small groups, the flexibility on the activities, the professional and knowledgeable guides and the top end accommodation and food, make a whole package that ensures you have a memorable experience. 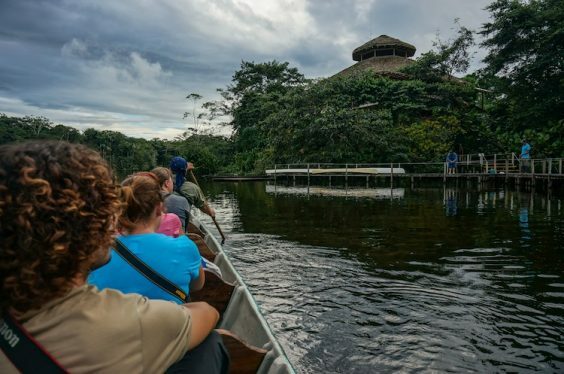 From adventure seekers to bird watchers, hikers and nature lovers alike, a visit to the Amazon rainforest won’t disappoint you. It’s an incredible and unique place that every traveler should visit at least once in their lifetime.